Over 200 children from Chesterfield schools donned caps and gowns earlier this week in order to attend their very own ‘ graduation ceremony’. 18 schools, both primary and secondary, throughout the town have taken part in 'The Children’s University' scheme which sees children as young as 4 encouraged to participate in out of hours learning activities, accruing points towards a 'degree' or award. 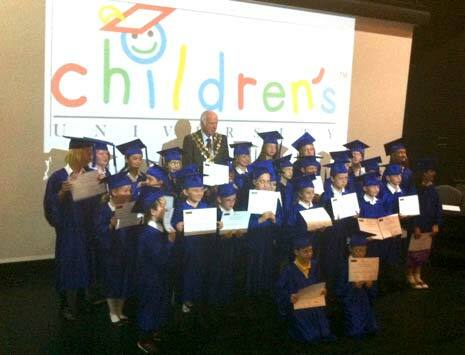 It was a proud moment for the children, their parents and staff at the schools as they watched children collect their certificates from The Mayor of Chesterfield in ceremonies held over 2 days in the Recital Room of Chesterfield College. The Children's University is thriving throughout the UK. It has some powerful supporters, including children's author Michael Murpurgo. 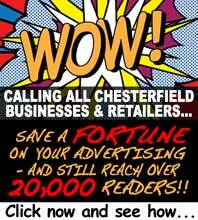 Rebecca Wilkinson is the coordinator of the scheme in Chesterfield and she said at the ceremony that, "The Children's University is a national organisation which passionately believes in the benefits of voluntary out of hours learning. It's not something done to you by school, but something you have a say in. If you're passionate about drama or art, you can commit to those things to get better at them. Children's self esteem and confidence is better if they're doing something they're good at." She told us that the ethos behind the scheme is a simple one, "It's called the Children's University because it's like university - you can choose the activities you want to do and can begin building a future for yourself, develop those passions that you can follow in later life. When you do go on to graduate in real life you can say it all started with the CU." Hollingwood School was just one school which had pupils graduating at the ceremony and the Headteacher Steven Hull was very proud of them and their involvement. He believes it is a worthwhile scheme, which has huge benefits for those involved. He told us ahead of the ceremony that, despite a hugely busy time at the school, the children had embraced the idea and thoroughly enjoyed being involved. "It's been a big success" he says, "We've been involved for the last 12 months, though we have had children involved over the last 2 years - there are 29 children here today but overall in school there are 70 involved at various stages of the programme. There is involvement for schools - with us monitoring the activities and the staff running any during the school day, and we encourage children to take part in them." He adds that the scheme is well run and supported, "The funding is crucial, Springwell have helped us by providing lots of arts into the curriculum - street dance music and instruments." Steve and his staff have just overseen a move into a brand new building and that he says, lends itself to the scheme too, "It's been an opportunity for the children and the school to provide an enriched curriculum and lifelong learning opportunities which we couldn't provide in the old school setting. The whole ethos of our new build is respect and encouraging children into the world having used resources and the quality of learning in a quality environment so we're enriching their experiences in life. A lot have now gone on to join their local dance or gym group as a result of this." So, what is the next step for Hollingwood and the Children's University? Steve hopes its onwards and upwards, "It's a great opportunity for celebration and to recognise the hard work that’s going on in our schools. There were 7 presentations alone yesterday - an awful lot of kids being provided for locally. The youth of today get a bad press but this is a good example of kids getting up off their backsides and doing something 24/7. It's to be encouraged and applauded." We spoke to parents of twins who were receiving a certificate and they said they were thrilled to be there. The dad of 8 year old Janick and Emma Harrison says that they've loved being part of it and that he's behind school all the way, "It encourages kids to be active which is a big thing - we cycle to school every day to keep them fit anyway but this helps too. "It's also good preparation for future education and it keeps them interacting with other children - we're very proud - it's really good, makes you happy that they do it and that the children see the passport you've got into other areas of life." It was a particularly proud moment for Chesterfield with 2 children being the only ones in the UK to get their full 'degree' after gaining 400 hours in total. Rebecca Wilkinson summed it all up perfectly saying, "You haven't been invited here because you're the best writer or athlete - we believe that the more hours you put in the more likely you are to achieve your goals, keep trying and be successful." Schools taking part included, Brampton, Hollingwood, Pilsley, Whitecotes, Staveley, Brimington, Parkhouse, William Rhodes, Inkersall, Norbriggs, Mastin Moor, Springwell, Catholic Cluster, Temple Normanton, Spire Juniors, Barlow, Grassmoor, Heath and Springwell.